It’s a new year, and I’m trying new things. 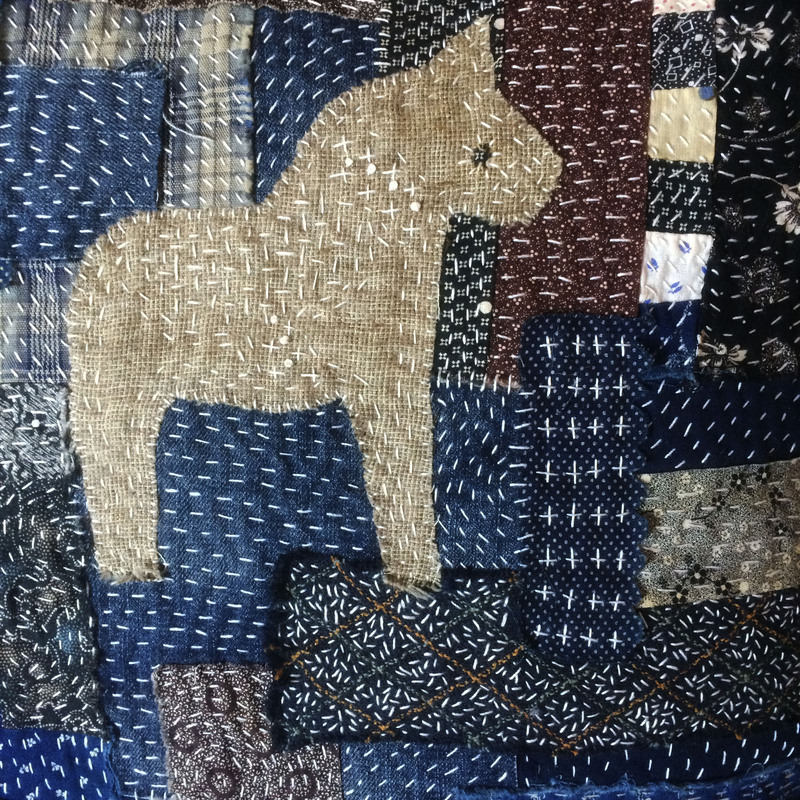 Boro style textiles have captured my imagination, and sashiko stitching can easily be embraced by those of us who are daunted by the skill and precision of traditional American dainty little quilting stitches. I’ve received such a positive reaction to my first piece and have gotten many questions, so I’m just going to lay out my process here. And remember, I have no idea what I’m doing. I’m just doing, and this was my first piece. I have graduated to my second, however, for whatever grandeur that might lend to my resume. 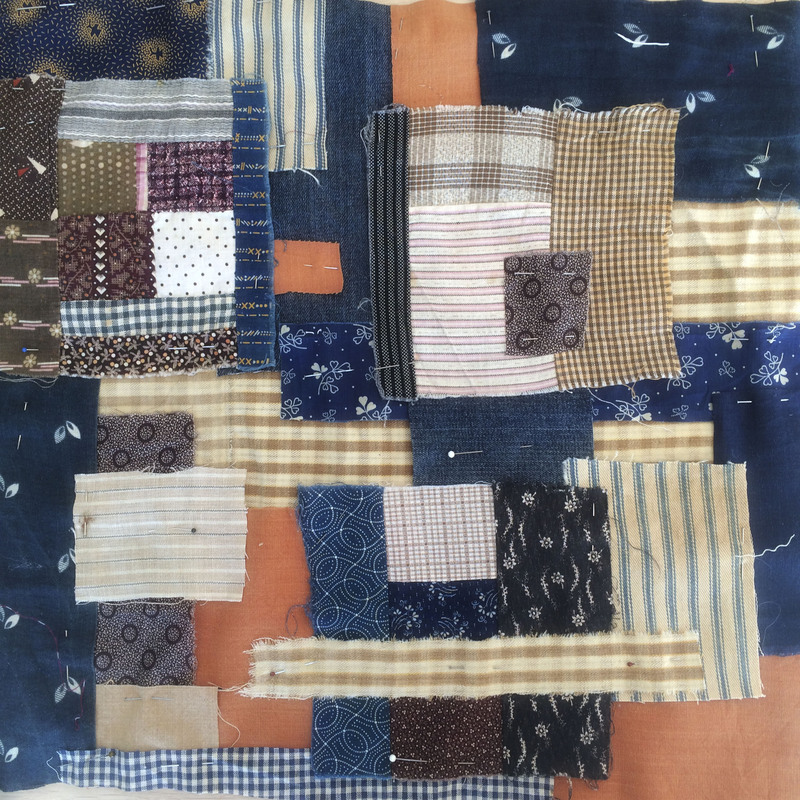 I started by gathering a selection of fabrics—new, old, antique, quilt squares, etc. that I thought might work well together. I know this sounds easy, but I spent the better part of an afternoon rearranging, editing, and changing up the whole thing. When it was time to go make dinner, this is where things were at. Then I walked away for the night so I could look at it with fresh eyes in the morning. Still happy then, I pinned everything down thoroughly. This is a wee bit out of order, but I layered all my random top pieces over a foundation fabric the size I wanted my finished piece to be plus seam allowance. 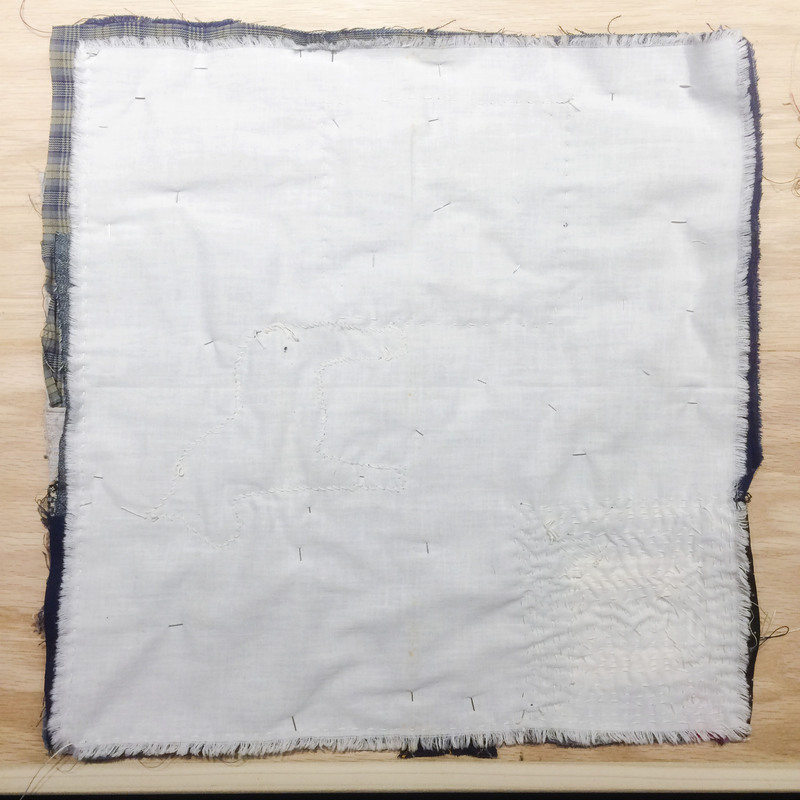 I happened to be using a vintage cloth napkin my husband deemed unacceptable as it resembled a torn up sheet, but you could use anything in your stash including an actual torn up sheet… Just don’t make it too thick because you will be stitching through it in addition to all your other top layers. 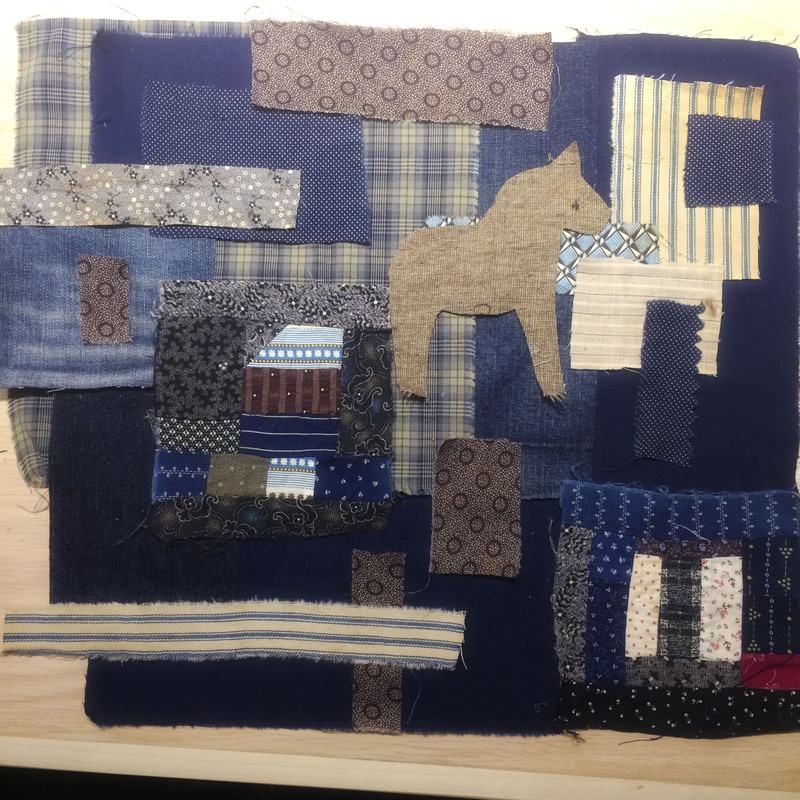 It’s a little different than what I did here, but I would recommend first starting with a row of running stitches around the entire perimeter of the piece. After that, anything goes. Then I just started stitching. Imperfect running stitches based on whim or influenced by the piece of fabric I was stitching over. Sashiko means “little stabs”, so just go at it and don’t worry about anything. 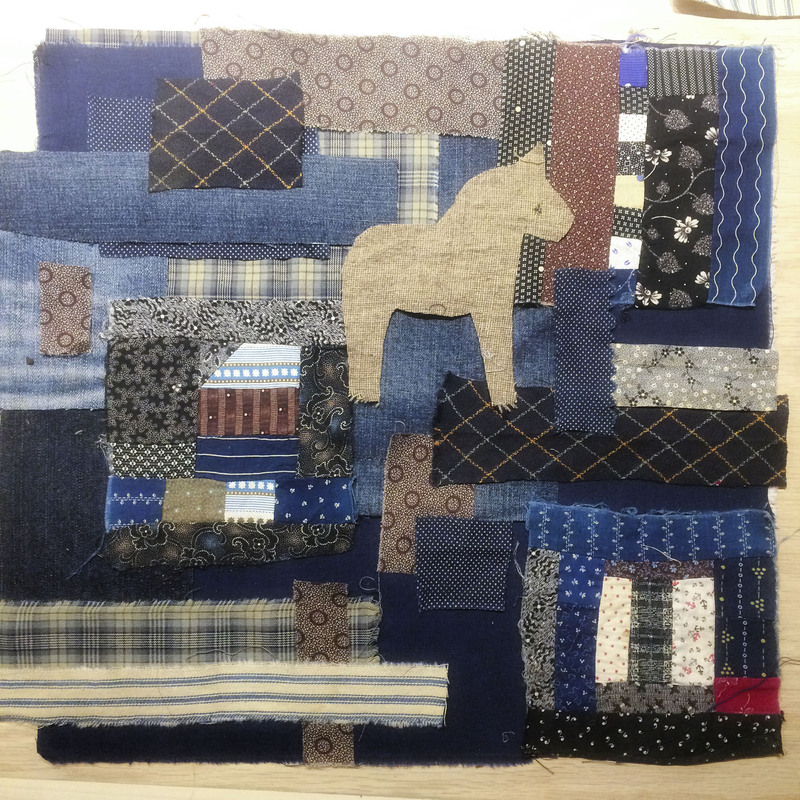 I jumped all over the piece, stitching where I felt like in no particular order. So that’s really it. I finished the first piece there and made it into an oversized pillow. This piece is now my second venture into the technique.